Charlé matriculated in 2015 at Durbanville High School. She then went to pursue her studies at The Isa Carstens Academy in Stellenbosch to complete her three-year Diploma in Somatology. Charlé also did her international CIDESCO exam and received top practical student in 2018. She also graduated in 2018 and was the runner up in the top theory award category. In her final year of studies, she was selected to do an internship at The Renewal Institute to gain experience and knowledge in the medical aesthetic arena and had the opportunity to experience and learn about medical aesthetic-oriented treatments and machines that provide a non-surgical solution. She started her career with The Renewal Institute at the Willowbridge branch as a therapist but received the opportunity to climb the corporate ladder and is currently part of the management team as a desk assistant. 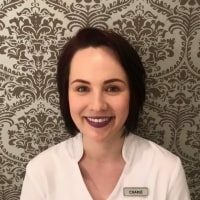 Charlé loves working with people and is so happy to be working alongside such an amazing team that is also passionate about this industry.